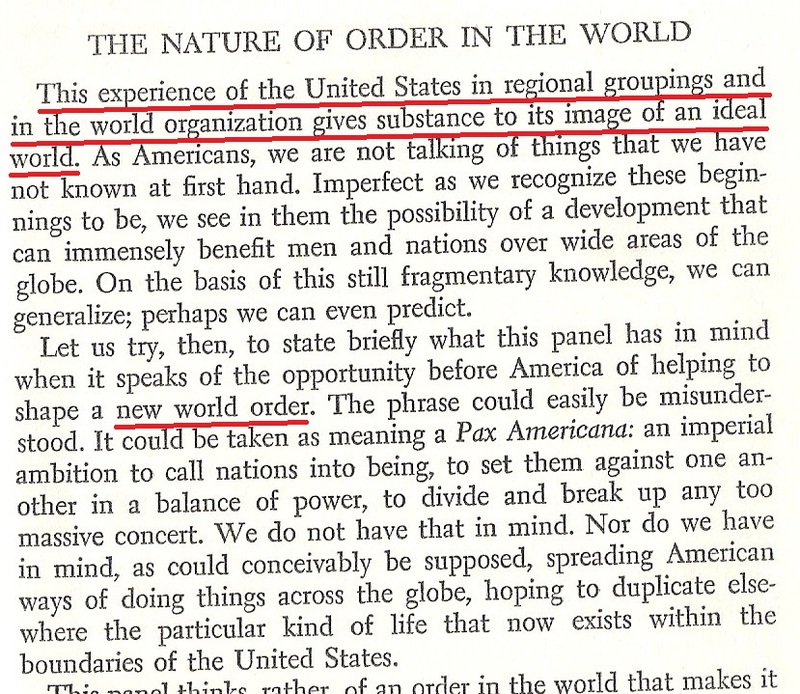 2) Putin’s promotion of the globalists’ UN as the solution to our current woes. Why did he spend the next 14 years playing along with the 9/11 “Official Story”? 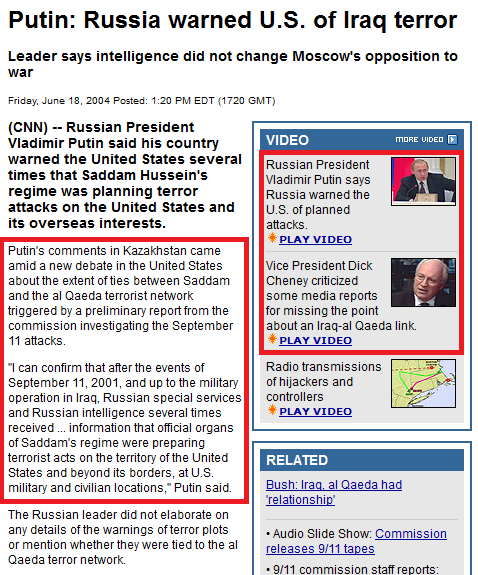 So Putin joined the globalist minion chorus in blaming the 9/11 attacks on Osama Bin Laden. 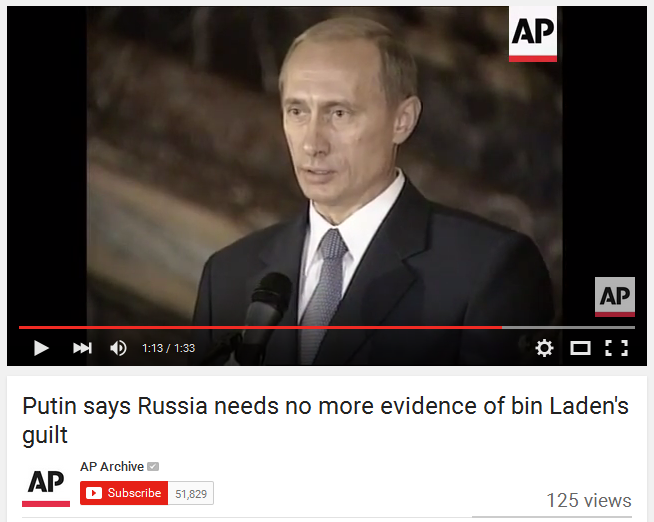 This being so, could it be that Russian intelligence was unaware of Bin Laden’s close relationship with the CIA? 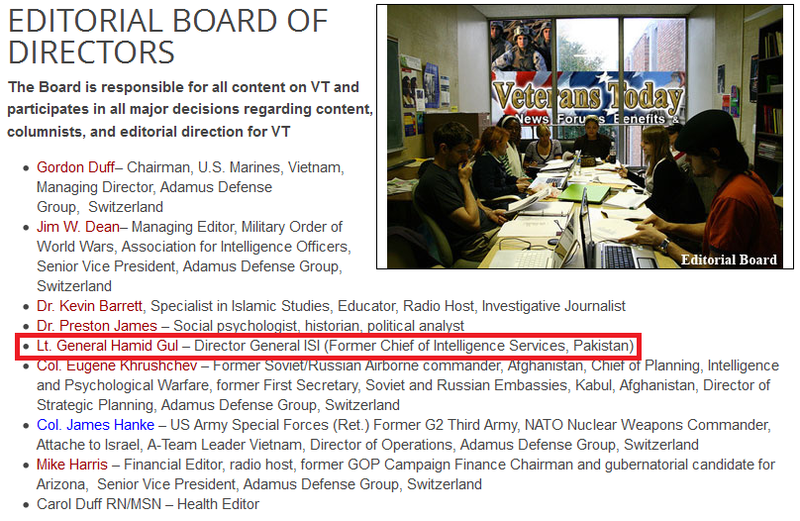 Given that Bin Laden was a key figure in Russia’s war in Afghanistan, you can be sure they knew all about his CIA ties. 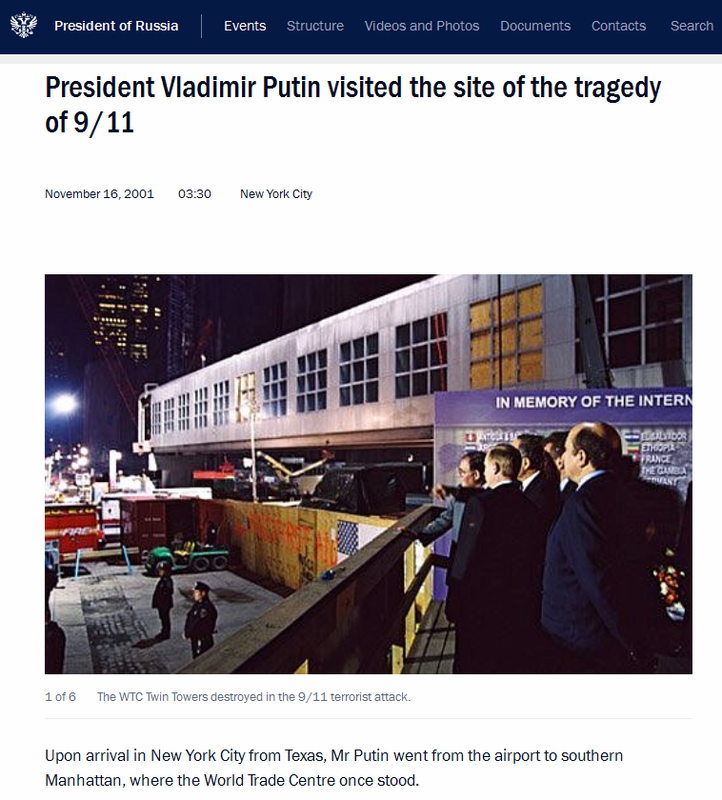 And this means that Putin was attributing 9/11 to someone he knew was a CIA asset. For any reasonable person, this strongly suggests the possibility that the attacks were a false-flag operation conducted by the CIA, but Putin said nary a word about that, did he? 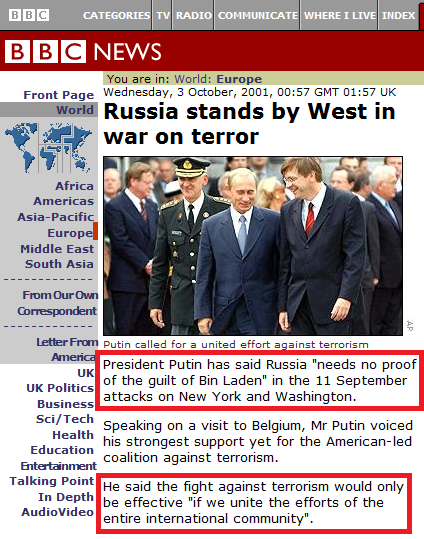 So in addition to blaming the 9/11 attacks on Bin Laden, Putin was a cheerleader for the US attack on Afghanistan. 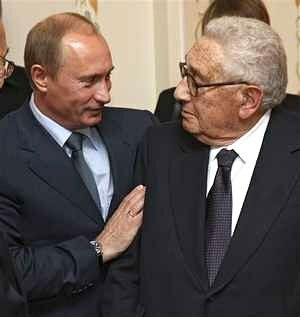 One wonders if he was compensated for his support by being given the Russian distribution rights for Afghan opium. And this section brings us to Putin, Russian intelligence, and their own false-flag attacks against the Russian people. The Russian government are no strangers to the art of statecraft, and they too have used 9/11-style attacks to launch military action in places like Chechnya. See the Russian Apartment Bombings and the Beslan School Massacre for examples of their operations. These guys are heavily involved in selling the East/West dialectic and the “savior” Putin to alternative news readers, which is why they put out garbage like the article featured at the top of this entry. 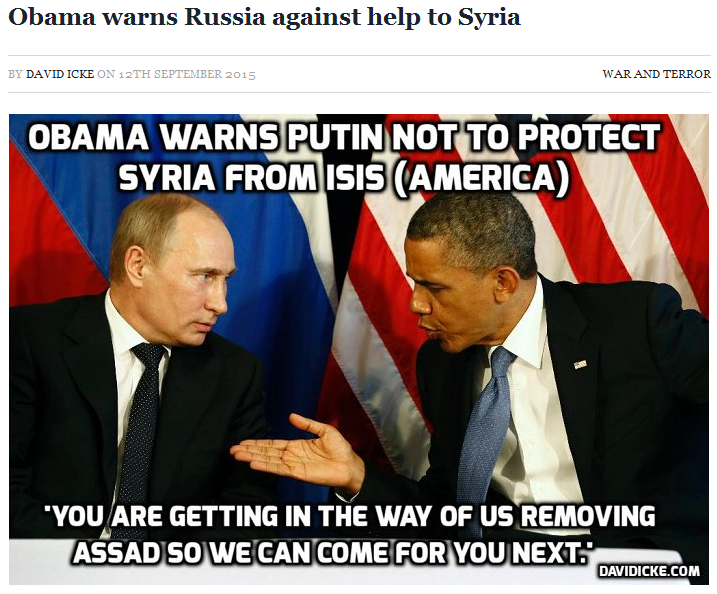 …From Kremlin.ru. So even by the Kremlin’s own words, he was supporting the US invasion of Afghanistan and calling Bush’s stance “well grounded.” Yep, that’s a real truth-teller for ya. Mr. Siegel: President Bush now speaks of Osama bin Laden as “the evil one.” He uses the word “evil.” Is he also exaggerating now, and is it also a slogan for the day, or do you think that’s true? 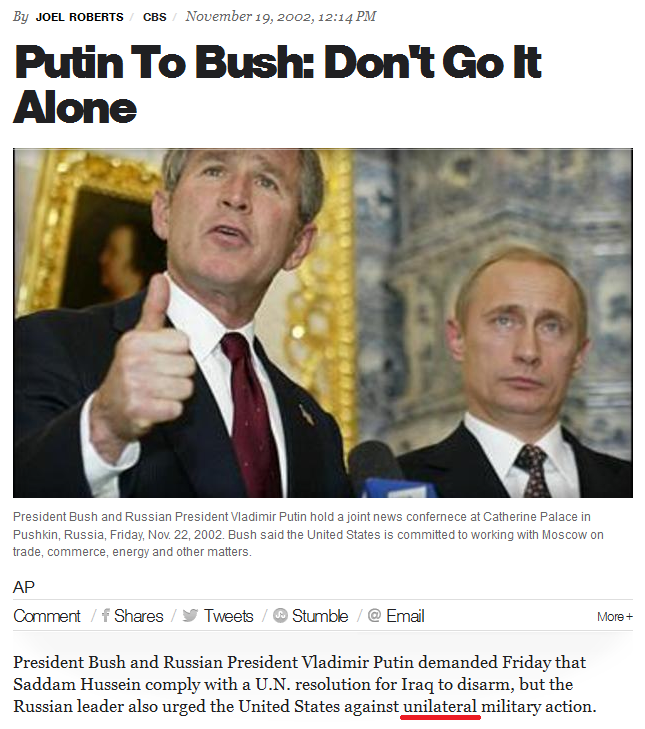 President Putin: Actually, I think President Bush is being very mild in his choice of words. I have other definitions and epithets to offer, but I, of course, am being restrained by the fact that I am talking to the media and this is hardly appropriate. 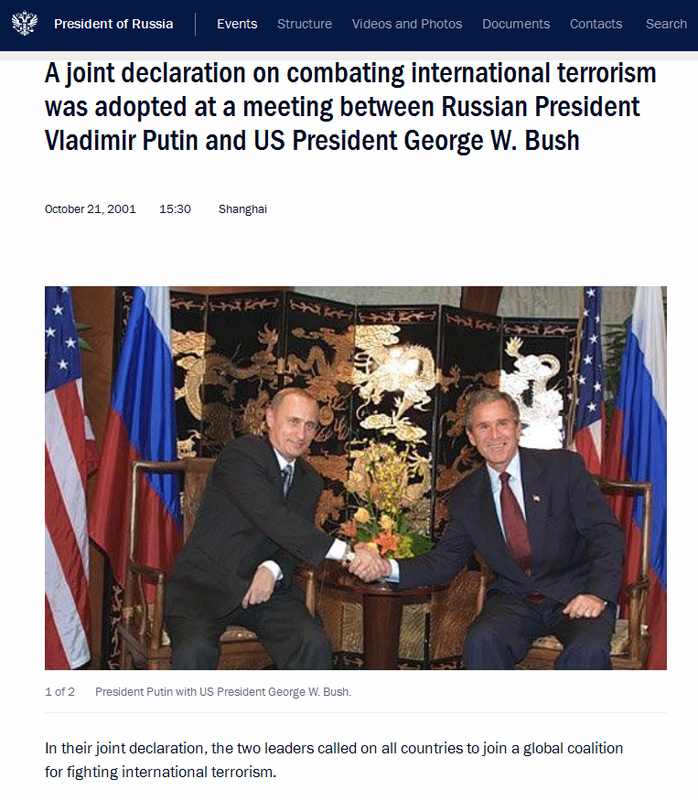 So when questioned on Bin Laden, Putin expressed no reservations; he backed up President Bush’s narrative with gusto. This passage reveals why Putin didn’t blow the whistle on Bush and 9/11. It’s because both he and Bush are globalist agents, and both he and Bush had conducted 9/11-style false-flags on their own people in order to advance the globalist agenda, both domestically (by tightening control over their people) and internationally (by drawing nations into multilateral efforts to fight “terrorism”). Putin hasn’t told the truth about 9/11 because it simply isn’t time yet. 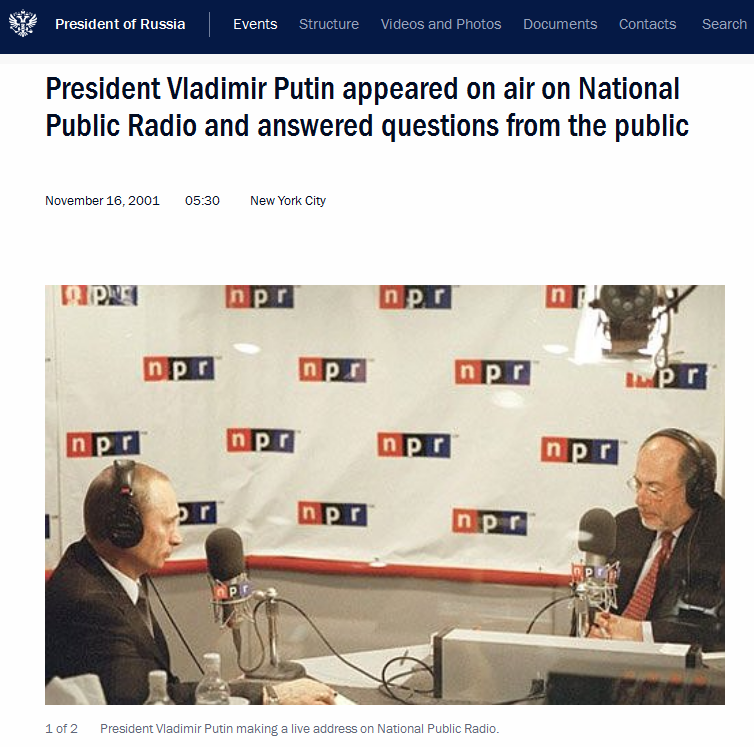 The globalists had much to do after 9/11 to get us to where we are today, and now that they’re about ready to spring the Good Cop beats Bad Cop con, you’ll finally hear Putin speak the truth (some time between now and September of 2016). >>> Mr Putin, in his turn, actively supported United Nations efforts against international terrorism, and stressed the necessity for all countries to comply with the resolutions and decisions of the UN Security Council and General Assembly. 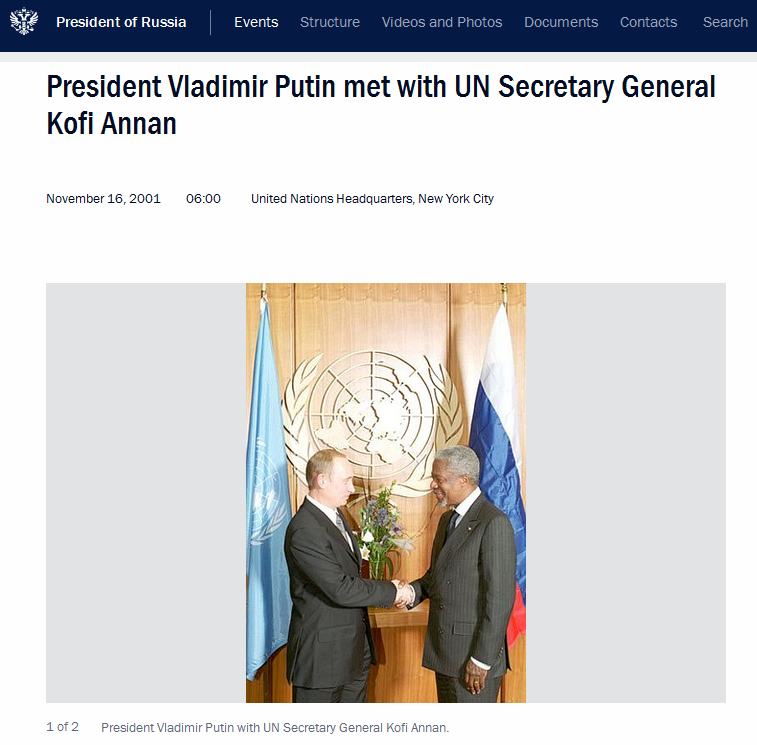 Mr Annan thanked Russia for its vanguard role in the UN’s fight against terrorism. 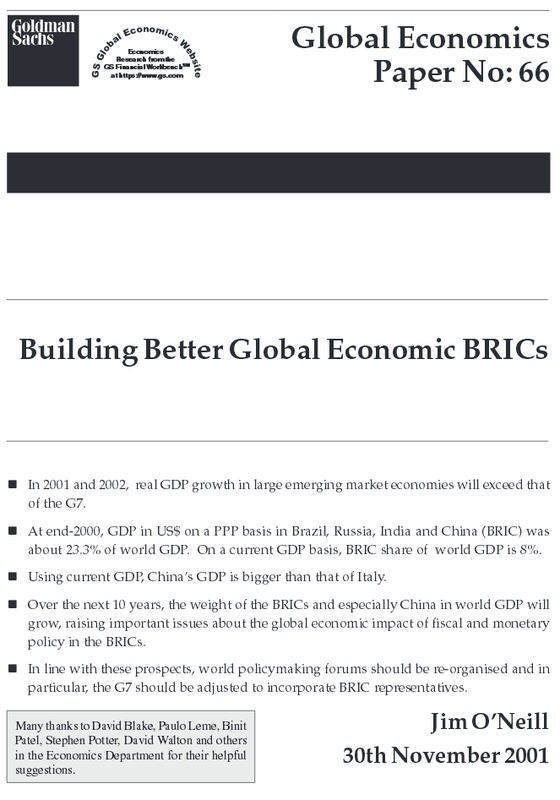 Isn’t it interesting that Goldman Sachs’ Head of Global Economics Research (and a darling of the London Establishment), “Baron O’Neill of Gatley,” was the one who started the BRICS movement? And from that point on, the globalists began to slowly divide the G20 into “shirts and skins” in order to run the East/West dialectic. The G7 shirts would be given the role of the bad guys, and the G5 skins (the BRICS) would be given the role of the good guys. Since the public have been raised from childhood on good guy vs. bad guy stories, letting the “good guys” bring in the NWO would be a nice, easy way to win the public over to the new system. > As the article states, the Iraq War was facing domestic criticism, so Putin said what was needed to help fend off opposition to the war on terror agenda. 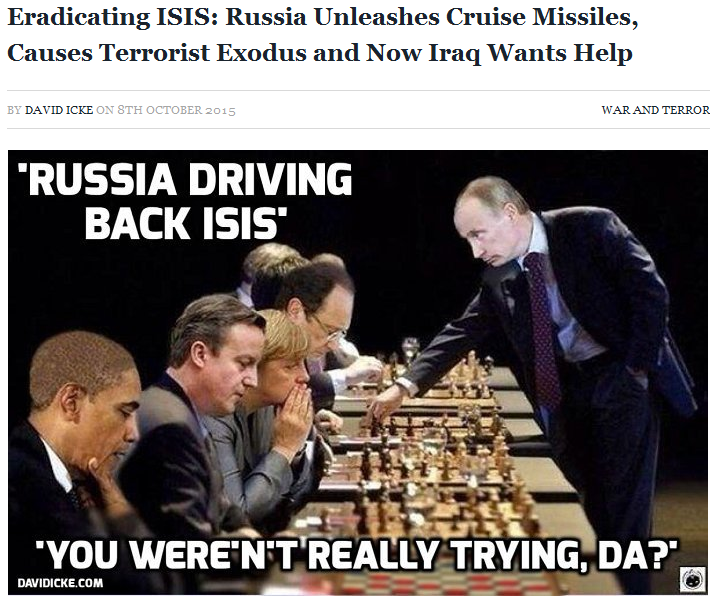 Since the globalists still had several years worth of work to do in the Middle East, Putin had to help keep the operation on track. > At the same time, he had to keep up the public stance of opposing the war so the dialectic conflict agenda could continue to develop. At the time the CNN article was written, there was still two years to go until the BRIC nations held their first unofficial meeting at the UN. So by talking opposition from one side of his mouth and providing support from the other side of his mouth, Putin followed the globalist plan to a T.
So it was in the womb of the United Nations that Baron O’Neill’s BRIC spermatozoon found its target, and the BRIC alliance was born there nearly five years later. A full-scale meeting was held three years after that, which gave rise to a statement on their joint agenda in May of 2008. Before we examine that statement, though, we must have a look at what Putin said at the Munich Conference on Security Policy in February of 2007. >>> …what is happening in today’s world – and we just started to discuss this – is a tentative to introduce precisely this concept into international affairs, the concept of a unipolar world. …The combined GDP measured in purchasing power parity of countries such as India and China is already greater than that of the United States. And a similar calculation with the GDP of the BRIC countries – Brazil, Russia, India and China – surpasses the cumulative GDP of the EU. And according to experts this gap will only increase in the future. One with the globalists’ UN playing the central role. 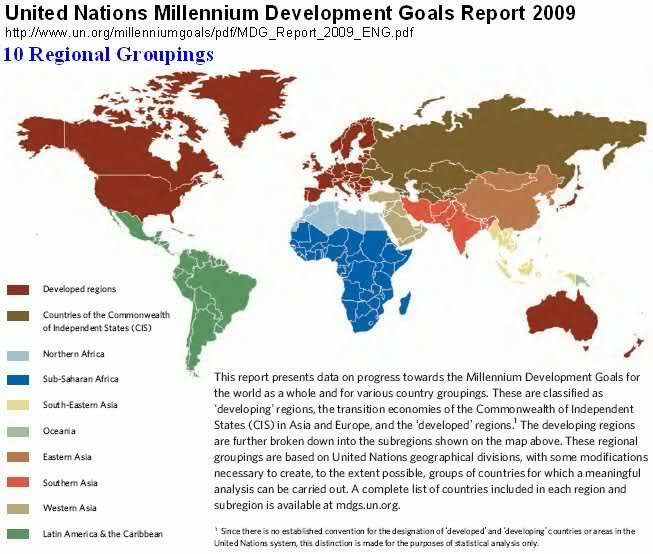 By conforming to the UN’s Sustainable Development rules and reaching the UN’s Millennium Development Goals of course. “The Ministers unequivocally condemned terrorism in all its forms and manifestations, committed for whatever purposes. They reiterated that terrorism constitutes one of the most serious threats to international peace and security and that the international community should take necessary steps to enhance cooperation to prevent and combat terrorism. They particularly highlighted the importance of the UN cooperation framework and the need for all member states to implement international conventions of the United Nations and UN Security Council resolutions on fighting terrorism. So we end globalist organized and funded terrorism by fully complying with the globalist UN’s Counter-Terrorism Strategy. Why didn’t I think of that?! Yep, it’s real, and everyone needs to follow the UN plan to mitigate it. in Western Europe, they have the EU to lead the integration. in Africa, they have South Africa to lead the integration. Can you see how the BRIC alliance helps pull the developing world into the UN’s regional system? With all this laid before us, we see that Putin and his BRICS alliance are helping bring in a New World Order centered on a region-based United Nations. 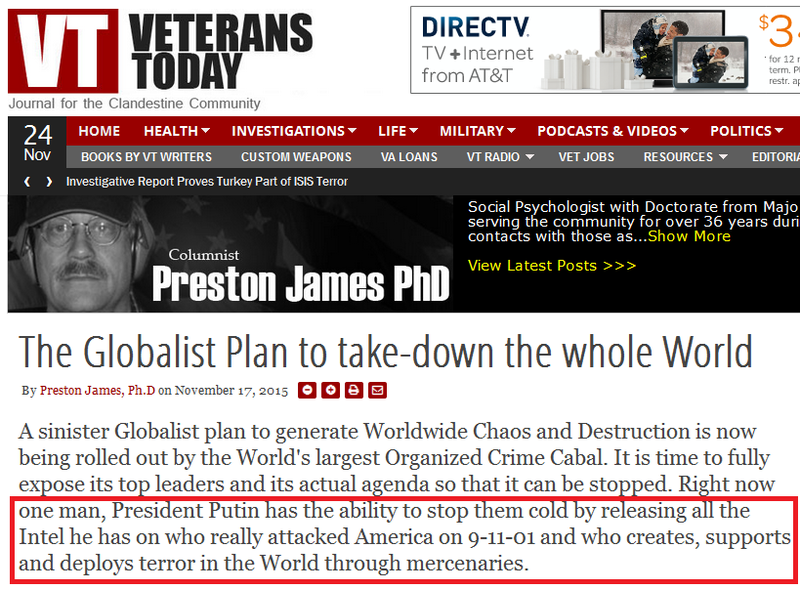 And in doing this, they are stopping the evil plans of the Western globalists, right? 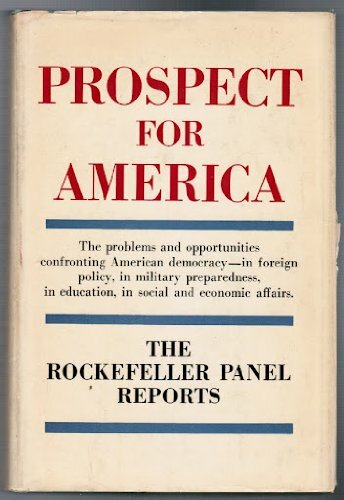 …And it was the result of a Rockefeller-funded initiative called the Special Studies Project. AND THE IMPERIALIST POWERS HAVE BEEN DEFEATED. If this reality causes you to lose your false hope, good. False hope must be released in order to grasp on to true hope. And false solutions must be rejected in order to make way for real solutions. Now that we’ve explored what Putin and the BRICS are really about, it’s time to turn our attention back to the laughably absurd Veterans Today article that inspired this essay. As we look upon it, let’s make some observations, address some key points, and find a reason for hope. 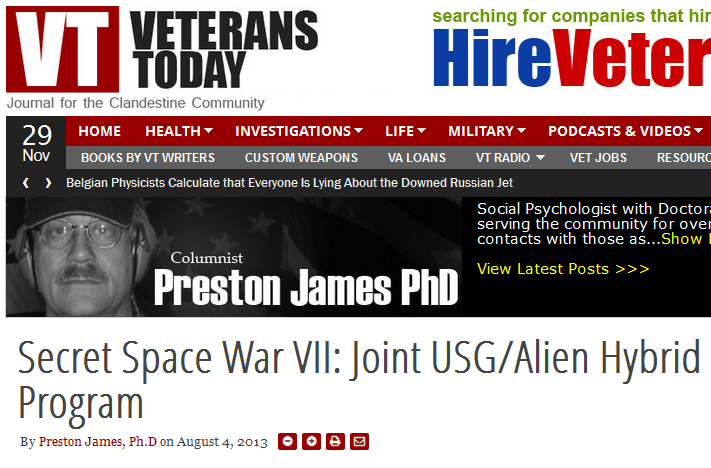 POINT 1 — The first thing of note is the author, Preston James, who describes himself as a Social Psychologist with “numerous” intel contacts. It’s important to realize that when you read Veterans Today, you are subjecting yourself to psywar. Their job is to mindfu*k you into accepting both the East/West geopolitical dialectic and the Christ/Antichrist spiritual dialectic. >>> And these “most evil criminals in history” fully realize that in order to take over the whole World they will eventually need to establish their own centralized massive military forces and secret police power. BEGIN EXCERPT>>> 1 – They set up a China-centered alliance as an opposing force to the Western alliance. 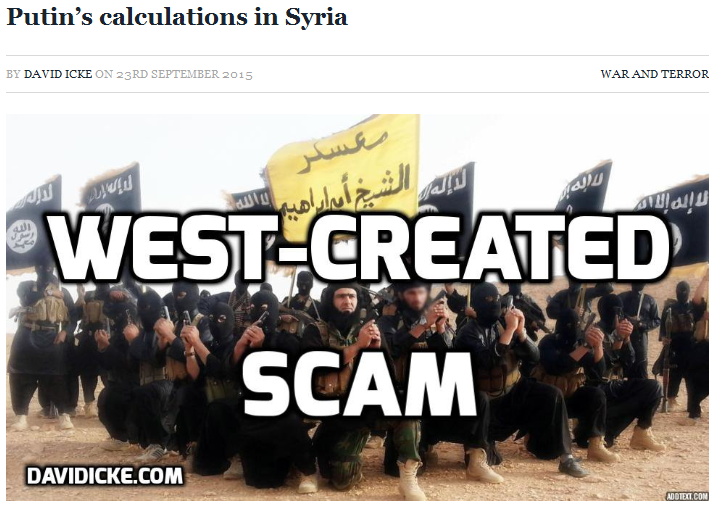 > They have broadly exposed damaging information about Western nations, especially the US. This is the motivation behind WikiLeaks, Snowden, and a thousand smaller disclosures. And after Snowden outed the NSA’s activities to the general public, where did he run to hide? First to China (Hong Kong), then to Russia. So what is the psychological message? China and Russia (the BRICS alliance) is where you run for safety from the evil US, its Western allies, and all their horrible behavior. 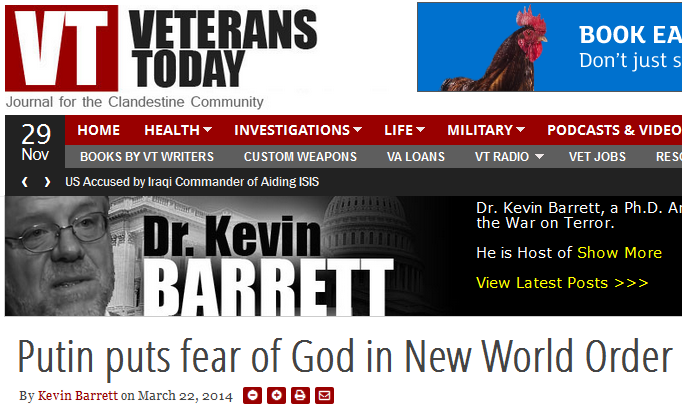 As you read the Veterans Today article, note how it serves to scare people away from the West and towards Putin (and the stronger UN he will bring in). 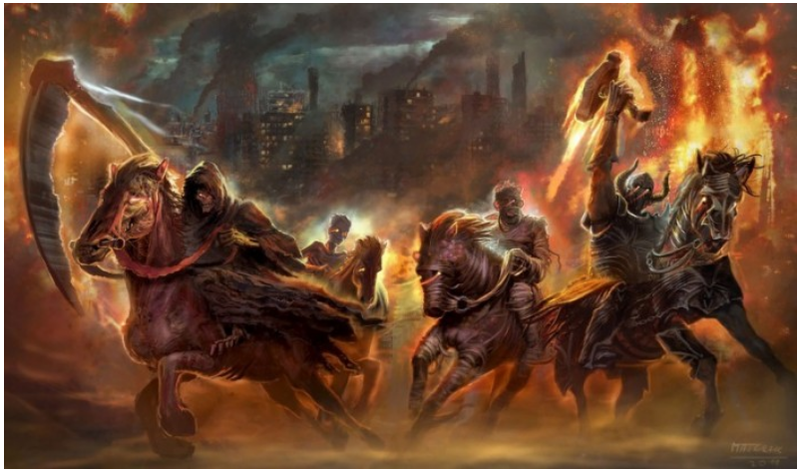 Can you see how the rampaging Western horsemen in the picture would scare rabbits towards the BRICS trap? “bad aliens” vs. “good aliens” conflict. …does it not? 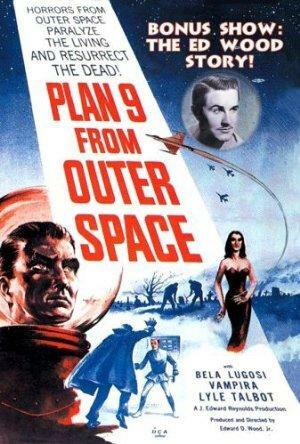 But the globalists might actually try to put on such a show. If you are interested in delving into this particular rabbit hole, I recommend you read Obama and the 2nd Coming. It’s a good primer on what to expect. >>> The Russian Federation under President Putin’s leadership seems to be a major exception to this apparent Worldwide Globalist control matrix. The fact that they even mentioned this tells us the War of the Narrative is turning against them. If their “Putin as hero” fairy tale were holding up, they would make no mention of the dialectic out of fear of drawing attention to it. They brought it up because they had to bring it up — they had to do something to combat it. And therein lies our hope: they are losing control of the narrative. This might seem like a small thing right now, but the complications this unleashes on the globalists will grow over time. This last paragraph is in keeping with Putin’s reported skepticism on manmade climate change: Putin Believes Global Warming ‘Is A Fraud To Restrain Developing Nations’. So this argument over “differentiated” measures versus “shared” measures might end up being the reason cited for Putin’s potential blocking of a climate deal at the upcoming summit. 1) The BRICS will force the West to accept “differentiated” carbon-cutting responsibilities in order to get a deal. 2) A unanimous deal will not be reached, and Putin will be cast as the one who blocked it. Either way, the globalist script will probably call for the evil West to punish Putin, so be on the lookout for “terrorist attacks” in Russia at some point after the Summit ends (and probably before the end of the year). Over the past few years, I’ve had a number of readers ask for my take on Alex Jones and David Icke. Let me begin my answer by stating that there are two mind control matrices that surround us: 1) the mainstream matrix in which most people are trapped, and 2) the controlled alternative matrix in which most awakening people get ensnared after they escape the mainstream matrix. Alex and David are both leading figures in the controlled alternative matrix. And just like Veterans Today, their job is to grab the attention of people who are starting to ask questions and mindfu*k them into accepting the dialectic. If you want to see an example of Alex Jones doing this, read Globalist Prophecy Watch: Update 1 – Alex Jones and the Christ Conspiracy. You’ll find it quite interesting. 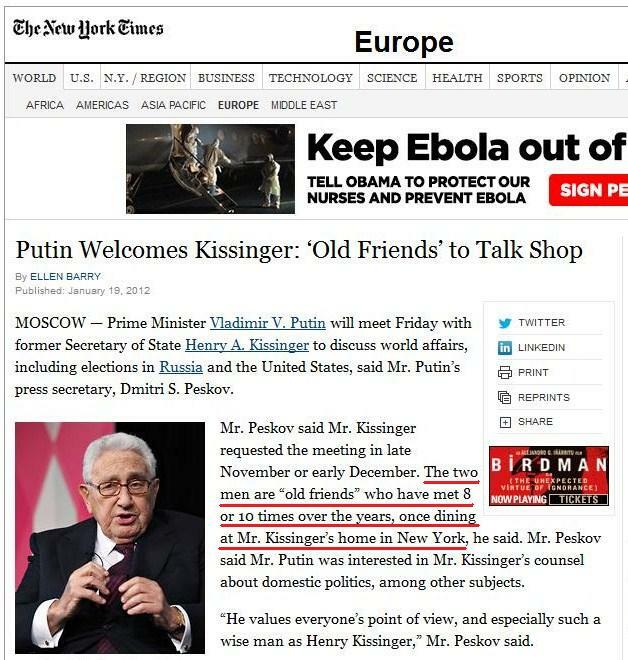 This entry was posted in NWO, Vladimir Putin on November 26, 2015 by kenneth.